Justin Bieber– we love to hate him anyway. But recently, manager Scooter Braun had worked day and night to polish up Bieber’s image, give him a decent hit album, and maybe pave the way to rapprochement. And, now it’s over. Social media is aflame with Bieber hate over a new incident that shows total disrespect to the fans themselves. This isn’t spitting on someone in public, or getting a speeding ticket. This is a slap right at his fan base, they feel. Bieber abruptly cancelled what’s called “Meet and Greet” appearances before his shows. Most recording stars have them now, including Madonna, Mariah Carey and Janet Jackson. Fans pay a high premium to meet their star and get a picture, either before or after the show. The price of a premium in this case was $2,000. You meet the Biebs, got a selfie, and had a great seat. 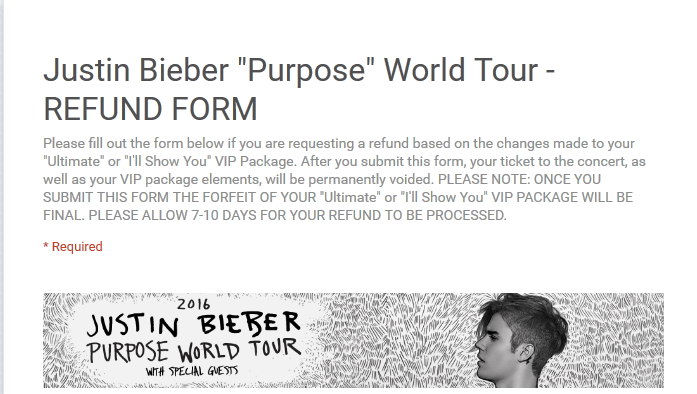 But Bieber’s cancelling of the M&G includes also giving back the ticket for a full refund. So, either pay the $2,000 and just see the show, or forget it. This has not gone over well. That’s just a sampling of what’s turning up on Twitter. Frankly, anyone who has enough money to waste $2,000 on a Justin Bieber ticket needs more help than a refund. But that’s just my opinion. The fact is, Bieber’s ill will on this subject is spreading fast– as things like this do these days. I WAS JUST STARTING TO LIKE JUSTIN BIEBER AGAIN AND THEN HE DOES THIS??!!?!?!?? And don’t forget– returning the tickets means Bieber can sell them again. Singing “Sorry” won’t help that at all.